Bikes ↑↑ Cars ↓↓ … again!! As usual, we counted bikes, cars and commercial vehicles in both directions on Lothian Road and Forrest Road, on the second Tuesday in May, during rush hour. For the first time ever, the count topped 500 bikes between 8-9am, whilst private cars were down from 1663 last May to 1617, continuing the long-term decline since our first ever May count, in 2007 when cars totalled 1995. This is a big success for the Council, which has a bold Local Transport Strategy target to cut car use from 43% of all trips in 2010 to just 31% in 2020. The long-term trend of cycling up significantly and car commuting down also ties in with trends in the 2011 census. Despite the growth in cycling and the fall in car use, there has been little change in commercial vehicle numbers over recent years [our count lumps together buses, taxis, vans and lorries]. Once again nearly 8 out of every 10 cars, 77%, have only one occupant – a huge waste of precious roadspace in the heart of the city. The 2011 Edinburgh census data confirms this picture, and additionally shows that many of the multi-occupant cars are on the school run. Therefore single-occupancy commuting is almost certainly significantly worse than our 77% figure. 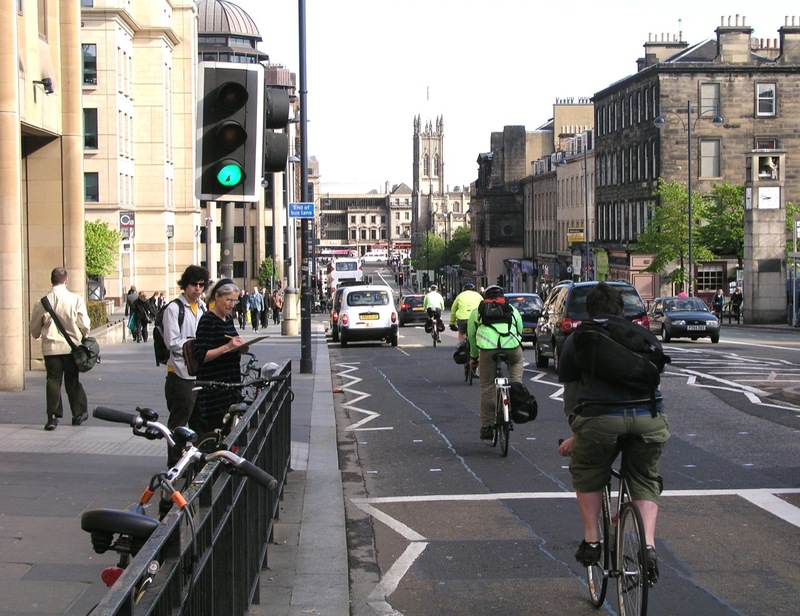 Lothian Road saw the biggest rise in cycling, up citybound from 19.1% of all vehicles to a remarkable 22.7% – and a big fall (mainly southbound) in private motor traffic. The level and growth of cycling demand, and the falling motor traffic, surely cry out for segregated cycling provision on this relatively wide, but scary, city-centre road. There are few roads in the city which would benefit so strongly from such a scheme and, as shown by the London superhighways [video1] [video2] there is almost certainly a big pent-up further demand from people who’d like to cycle but don’t feel safe until they have the right conditions. In Forrest Road cycling also rose – from 25% of all citybound vehicles last May to 26.1%, the highest figure ever. Private cars levels rose marginally from last May, but not enough to cancel out the big Lothian Road fall in car use. [Incidentally, the Meadows public bike counter recorded 258 at 0815, and 562 at 0920, a total of 304 bikes in both directions – though of course it counts more directions than our onroad count]. Strangely, the increased cycling levels in the last 5 years or so have been almost entirely citybound, with little change southbound. Indeed this year cycling levels actually fell slightly southbound at both Forrest Road and Lothian Road, though this was masked by the big citybound increase. Susprisingly, car patterns are somewhat similar, with a much bigger fall in southbound car traffic than citybound. If anyone can give a convincing explanation of the reasons, let us know!! Our Spring Bulletin headlined the benefits of bikes for businesses of many kinds. In terms of directly bike-related business, it has just been pointed out to us that not only does Edinburgh now have record levels of cycle use, but it also has record numbers of bike shops!! The 2010 edition of the Spokes Edinburgh map listed 13 bike shops. The forthcoming 10th edition will list 32! The Council should take every advantage of its success to speed up its plans to boost cycling (as well as walking and public transport). The planned East-West segregated route should be progressed robustly; there is an ever stronger case for cycle facilities on Lothian Road (see above); and the council should certainly think again about its inexplicable proposal to allow motor traffic to use all bus lanes off-peak and to scrap Saturday bus lanes altogether. 2 comments to Bikes ↑↑ Cars ↓↓ … again! !